To Cite: Babanejad M, Izadi N, Najafi F, Alavian S M. The HBsAg Prevalence Among Blood Donors From Eastern Mediterranean and Middle Eastern Countries: A Systematic Review and Meta-Analysis, Hepat Mon. 2016 ; 16(3):e35664. doi: 10.5812/hepatmon.35664. Context: The world health organization (WHO) recommends that all blood donations should be screened for evidence of infections, such as hepatitis B. The present study aimed to determine the prevalence of hepatitis B surface antigen (HBsAg) in blood donors at the eastern Mediterranean region office (EMRO) of the WHO and middle eastern countries. 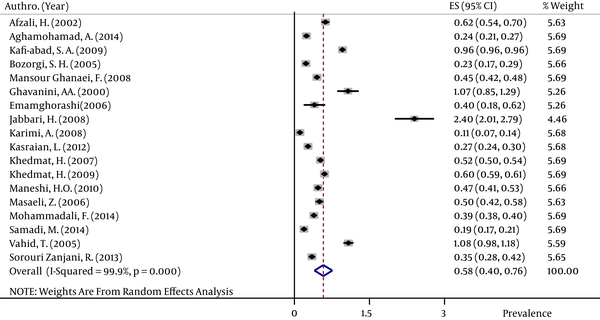 Evidence Acquisition: A meta-analysis was carried out based on the results of an electronic literature search of PubMed, Ovid, Scopus, and Google Scholar for articles published from January 1, 2000, to August 31, 2015. In accordance with a significant homogeneity test and a large value of I2, the random effects model was used to aggregate data from the studies and produce the pooled estimates using the “Metan” command. Results: We included 66 eligible studies. The pooled prevalence of HBsAg in blood donors of both EMRO and middle eastern (E and M) countries was 2.03% (95% confidence interval [CI]: 1.79 – 2.26). In addition, the prevalence rates in the EMRO countries was 1.99% (95% CI: 1.84 – 2.14) and 1.62% in the Middle Eastern countries (95% CI: 1.36 – 1.88). The prevalence among blood donors with more than one study was 1.58% in Egypt, 0.58% in Iran, 0.67% in Iraq, 2.84% in Pakistan, 3.02% in Saudi Arabia, 1.68% in Turkey, and 5.05% in Yemen. Conclusions: Based on the WHO classification of hepatitis B virus (HBV) prevalence, the prevalence of HBsAg in blood donors from E and M countries reached an intermediate level. However, there were low prevalence levels in some E and M countries. Hepatitis B virus (HBV) is a public health problem and a major cause of mortality and morbidity (1). Almost 30% of the world population is infected with HBV, and more than 600,000 people die each year from acute disease or chronic sequelae secondary to HBV infection. Hepatitis B surface antigen (HBsAg) is the earliest marker of acute infection and is helpful for the diagnosis of HBV infection. The carrier rate varies from 0.1 to 20% for this marker in different communities (2, 3). Blood donation is an important, lifesaving intervention. The world health organization (WHO) recommends that all blood donations should be screened for evidence of infections, such as human immunodeficiency virus (HIV), hepatitis B and C, and syphilis. Information provided by 164 countries to the WHO global database on blood safety showed that worldwide, more than 92 million blood samples are donated annually. Of these, an estimated 1.6 million units are excluded due to the presence of infectious markers, including HBsAg (4, 5). In the multiple countries where pre-transfusion screening of blood donations for HBsAg is conducted systematically, and the high-risk groups are rejected from blood donation, the prevalence of HBV in blood donors is less than that in the general population; this results in underestimation of the extent of this issue. However, the risk of transmission still exists in several developing countries (3, 6). The eastern Mediterranean regional office (EMRO) is a one of the six regional offices of the WHO around the world, consisting of 22 member states with a total population of 605 million individuals (7). It is estimated that about 4.3 million people are infected with HBV in this region (8). Unsafe blood transfusion and poor public health awareness are the major risk factors for HBV infection in this part of the world (1). The WHO has defined prevalences of < 2%, 2 – 8%, and > 8% as low, intermediate, and high prevalences of HBV, respectively (2). In the EMRO and some Middle Eastern countries, low–intermediate and high prevalence of HBV have been reported across all age groups (1, 9). Several studies conducted in the EMRO and middle eastern (E and M) countries have investigated the prevalence of HBsAg positivity in blood donors and have reported different values. A study conducted on approximately 15 million Iranian blood donors over 10 years showed that about 1% of blood donors were HBsAg positive, and the prevalence declined over the study period (10). Another large-scale study conducted by Mohammadali et al. (2014) (11) over 6 years showed that only 0.5% of blood donors were HBsAg positive in Iran. A study performed on more than six million Turkish blood donors reported that more than 4% of this population was HBsAg positive, while the study by Tigen et al. (2015) (12) showed an HBsAg prevalence of 1.5% in Turkish blood donors (13). The prevalence increases in the blood donors of Djibouti (14) and Pakistan (15), with rates up to 10% and 6%, respectively. There have been several single-center studies on the prevalence of HBsAg positivity in blood donors from E and M countries, but they have reported different estimates. In addition, there are no comprehensive and reliable data with a large sample size on the prevalence of HBsAg positivity in these regions. Therefore, the present study aimed to determine the prevalence of HBsAg positivity in blood donors of E and M countries using a systematic review and meta-analysis of published cross-sectional studies during 2000 – 2015. An electronic literature search through two MEDLINE and EMbase databases (PubMed and Ovid), Scopus, and Google Scholar was carried out for articles published from January 1, 2000, to August 31, 2015, using different combinations of the following keywords in titles and/or abstracts: “Prevalence,” “Epidemiology,” “Hepatitis B virus,” “HBV,” “HBsAg,” and “Blood donors.” These keywords were combined with the names of the following E and M countries: Afghanistan, Bahrain, Cyprus, Djibouti, Egypt, Iran, Iraq, Jordan, Kuwait, Lebanon, Libya, Morocco, Oman, Pakistan, Palestine, Qatar, Saudi Arabia, Somalia, Sudan, Syria, Tunisia, Turkey, United Arab Emirates, and Yemen. Iranian databases, such as IranMedex, Magiran, Medlib, and the scientific information database, were also searched using relevant English and Persian keywords. PakMediNet was searched for related epidemiological studies. The eastern Mediterranean journals from the WHO–EMRO indexing site were also searched. Search sensitivity was assessed by considering overlapping articles. If the full text of articles was not available, emails were sent to authors. If the authors did not respond after 1 month, informative abstracts were used for data extraction. Articles with no informative abstracts were excluded. Published studies in English, Persian, French, and Arabic were considered if they met the following criteria: 1) the studies were cross-sectional and 2) had clearly declared information on the number of HBsAg-positive cases among healthy blood donors from E and M countries. The exclusion criteria were as follows: 1) studies on blood donors who had positive HBsAg, 2) studies reporting confusing data or probable errors, and 3) studies with fewer than 1,000 samples. Studies without any information on the country were retained for reviewing. Author name or journal title had no effect on the choice to exclude or include the articles. Data extraction was conducted separately by one researcher (M.B. ), and critical evaluation for quality assessment of the articles was performed by another researcher who was not involved in the literature search (S.M.A.). A meeting was scheduled before the critical evaluation, and researchers were justified about the questions. After the critical evaluation, the selected articles were checked by both the authors. The selected and included citations were reviewed, and data were extracted to excel spreadsheets, which included the first author’s name, year of publication, name of country, sample size, male percentage, and HBsAg prevalence and its standard error (SE). 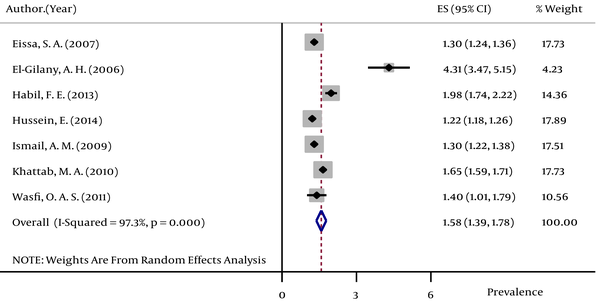 If there were other parameters reported besides SE, such as standard deviation, confidence interval, and/or P value, a suitable modification was performed to calculate SE. SE was estimated using the following formula: SE = √(P × (1 − P)/N) (P = prevalence, N = sample size). The SE of HBsAg prevalence in each study was estimated based on the binomial distribution formula. Cochran’s Q-test of heterogeneity was performed to detect homogeneity among the studies. Higgins and Thompson’s I2 was also applied due to the inherent limitations of Cochran’s Q in detecting true heterogeneity. Depending on whether homogeneity or a large value of I2 was found, a fixed or random effects model, respectively, was used to aggregate data from studies and produce the pooled estimates, with the “Metan” command. 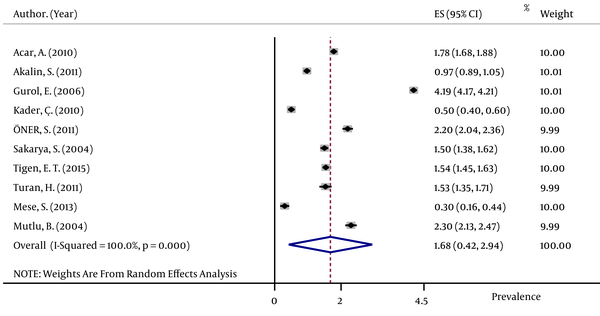 Results were provided as forest plots with description of the findings in the plots, and the point estimations and their 95% confidence intervals (CIs) were computed accordingly. The analyses were performed using Stata software, version 11. Based on the data gathered from titles and abstracts, out of 4,125 citations, 86 of them were potentially related to HBsAg prevalence in blood donors from E and M countries. All of the papers were carefully examined to avoid including duplicate papers; two studies with duplicate data from the same group were excluded (16, 17). Four studies were excluded because they were not original (18-21). We found three publications that were not available online, and despite contacting their authors or publishers, we could not obtain their abstracts (22-24). In addition, two papers reporting confusing or insufficient data were removed (25, 26). There were nine studies with sample sizes of less than 1,000 people from Egypt, Iran, Pakistan, Somalia, Sudan, and Yemen that we excluded from the meta-analysis to avoid the effect of lower sample size (27-35). However, because we had no information in our meta-analysis on the HBsAg prevalence in Somalia or Sudan, we reviewed three studies that reported the HBsAg prevalence in these two countries (33-35) (Figure 1). Therefore, the remaining 66 studies, involving 28,947,262 blood donors and assessing HBsAg prevalence in E and M countries, were considered for the meta-analysis. Out of these, 18 studies related to Iran (10, 11, 36-51), 14 to Pakistan (15, 52-64), 10 to Turkey (12, 13, 65-72), 7 to Egypt (73-79), 7 to Saudi Arabia (80-86), 2 to Iraq (87, 88), and 2 to Yemen (89, 90). There was one study each from other countries, which included Cyprus (91), Djibouti (14), Jordan (92), Kuwait (93), Lebanon (94), and Morocco (95). There were no data available for the following countries: Afghanistan, Bahrain, Libya, Oman, Palestine, Qatar, Saudi Arabia, Syria, Tunisia, and the United Arab Emirates. Information on HBsAg prevalence in blood donors was available from 13 countries. Pooled prevalence of HBsAg in blood donors of all E and M countries was 2.03% (95% CI: 1.79 – 2.26). When these countries were divided into groups, the prevalence in the EMRO countries was 1.99% (95% CI: 1.84 – 2.14), and that in Middle Eastern countries was 1.62% (95% CI: 1.36 – 1.88; Tables 1 - 3). 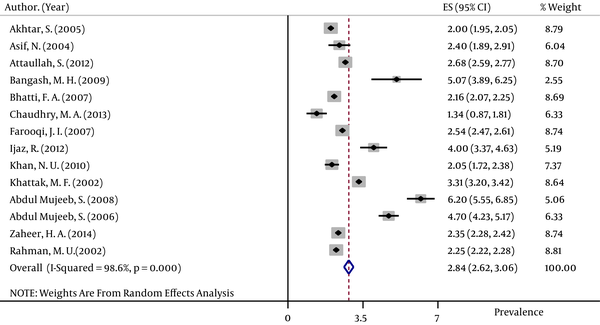 aPooled estimate by random effects meta-analyses. b95% confidence interval (in parentheses). The pooled HBsAg prevalences in blood donors considered in more than one study were 1.58% (95% CI: 1.39 – 1.78) in Egypt (Figure 2), 0.58% (95% CI: 0.4 – 0.76) in Iran (Figure 3), 0.67% (95% CI: 0.61 – 0.73) in Iraq, 2.84% (95% CI: 2.62 – 3.06) in Pakistan (Figure 4), 3.02% (95% CI: 2.2 – 3.84) in Saudi Arabia (Figure 5), 1.68% (95% CI: 0.42 – 2.94) in Turkey (Figure 6), and 5.05% (95% CI: 4.64 – 5.44) in Yemen. The prevalences in countries considered in only one published article were 3% (95% CI: 2.54 – 3.45) in Cyprus, 10.4% (95% CI: 10.2 – 10.59) in Djibouti, 1.72% (95% CI: 1.53 – 1.9) in Jordan, 1.92% (95% CI: 1.68 – 2.15) in Kuwait, 0.92% (95% CI: 0.77 – 1.07) in Lebanon, and 0.95% (95% CI: 0.9 – 0.99) in Morocco. One study from Somalia showed that among 115 healthy blood donors, 22 (19.1%) were HBsAg positive (35). Two other studies from Sudan reported that among 400 and 260 male blood donors, 25 (6.25%) and 26 (10%) donors were positive for HBsAg, respectively (33, 34). The present study showed that the pooled prevalence of HBsAg in blood donors of E and M countries was 2.03% (95% CI: 1.79 – 2.26), which is considered an intermediate prevalence as defined by the WHO. The prevalence in Iran was 0.58%, which was lower than that in other E and M countries. Based on the world bank list of middle-income countries, among the 13 E and M countries from which data were used in our meta-analysis, 10 countries are members of middle-income countries (96). The WHO has estimated the prevalence of HBV in blood donors of middle-income countries to be in the range of 0.19 to 2.33%, which is comparable with our results (6). The results of two individual studies on 7,277 and 3,292 blood donors in the Democratic Republic of the Congo showed that 9.2% (97) and 3.7% (98) of blood donors were found to be positive for HBsAg, respectively. In addition, the prevalences of HBsAg in blood donors were 18.6% in Nigeria (99), 12% in Ghana (100), 10.1% in Equatorial Guinea (101), 4.7% in Ethiopia (102), and 14.96% in Burkina Faso (103), which shows that the prevalence of HBsAg in most of the African countries was higher than that observed in our meta-analysis of E and M countries. The prevalence of HBsAg among blood donors of the WHO south-east Asian regions showed a different pattern. The values were 1.09% (104), 1.27% (105), and 1.7% (106) in India; 1.4% in Bangladesh (107); 0.53% in Nepal (108); and 2.6% in Thailand (109), which indicate that the range of available data in these regions is somewhat comparable with the prevalence in E and M countries. A systematic review in 24 European countries (110) showed that the HBsAg prevalence in first-time blood donors was 0.74%. In addition, another study conducted on more than 1 million blood donors in the United States (111) showed that the prevalence was only 0.04%, indicating that the infection rates in Europe and US were lower than that in our region. Overall, it seems that the discussed differences in HBsAg prevalence in blood donors reflect a disparity in prevalence among the population who are suitable to donate blood, the types of donors (such as voluntary unpaid blood donors from lower risk groups), and the quality of blood processing (6). According to our results, the pooled estimate of HBsAg infection was higher in other E and M countries than Iran, which exhibited a prevalence of 0.58% in its blood donors, while the prevalence increased for Yemen and Djibouti, by up to 5.05% and 10.4%, respectively. This lower prevalence in Iran can be attributed to the effectiveness of the screening system, the selection of eligible donors, and the high vaccination coverage for HBV in the first years of life (11, 112). In addition, low public awareness, particularly for the general population (113), unsafe services for blood donation (114), and a higher rate of HBsAg infection in the general population (115) may contribute to the higher prevalence of HBsAg in other E and M countries. The strength of the current study was that the search strategy was performed with high sensitivity with all related keywords to include most of the available published studies. In addition, the large sample size of this study was another strength; it included 28,947,262 blood donors from E and M countries. The first limitation of this study was that the quantity and quality of data varied by country. To decrease the effect of studies with low sample sizes on the estimated prevalence, we excluded studies with fewer than 1,000 samples. Another limitation of this study was that some databases, such as web of science, were not searched due to sanction limitations in Iran. In addition, university research projects and students’ theses were not included in our search. Based on the WHO classification of HBV prevalence, the prevalence of HBsAg in blood donors of E and M countries represented an intermediate level (2.03%), while the individual prevalence rates in each of the EMRO (1.99%) and middle eastern (1.62%) countries was low. The available data showed a wide disparity in the prevalence of HBsAg among the E and M countries. The lowest prevalence of HBsAg was seen for Iranian blood donors, while the highest rate was observed in Djiboutian blood donors. We are grateful to the Baqiyatallah University of Medical Sciences and all of those people who helped us to conduct this study. Authors’ Contribution: Mehran Babanejad, contributed to the study concept and design, acquisition, analysis, interpretation of the data, and drafting of the manuscript; Neda Izadi, contributed to the analysis; Farid Najafi, contributed to the interpretation of data and language revision of manuscript; Seyed Moayed Alavian, contributed to the study concept and design, data acquisition, and drafting of the manuscript. Funding/Support: This work was supported by Baqiyatallah University of Medical Sciences. The funding agency did not play any role in the planning, execution, or performance of the study or in the decision to submit the paper for publication. 96. Country and Lending Groups.